Pam’s Pictorama Photo Post: While clearly not Felix these cats are pretty spectacular in their own right – not to mention the little Shriner-esque fellow driving. This float was honoring the 70th Anniversary, Swiss Settlers Swiss Colony, August 16, 1885-1915, New Glarus, Wis. (I have taken the liberty of checking up on New Glarus and, sure enough, it is still known as America’s Little Switerzland today.) The stand-out supporters of this float appear to have been Hole-Proof Hosiery and Masurys Paints. Sadly the other banners do not appear to be legible, even when I blow this up. The support of these fine businesses now lost to the sands of time. Before taking note of the year, I thought this card was from a somewhat later period, but date notwithstanding, on closer inspection the car is a very early one and the storefront and house in the background are early too. 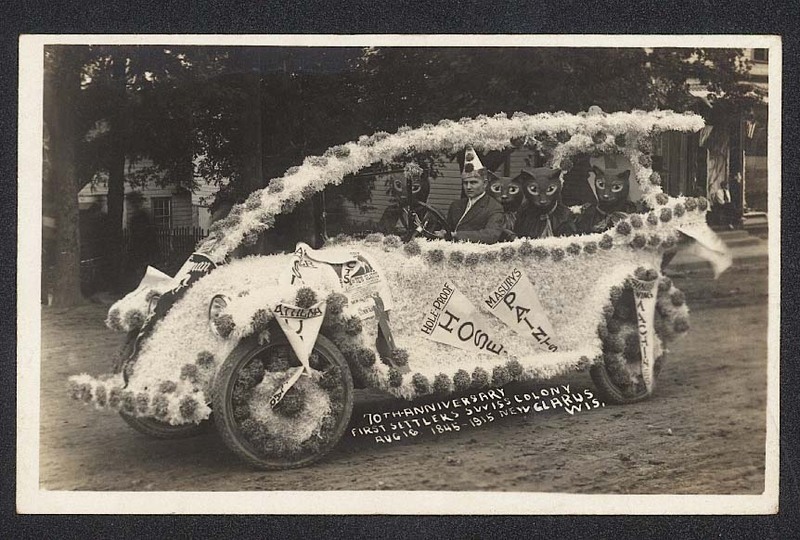 Seems very much Main Street, USA, circa 1915 except that the cats look like they could be from decades later – with a somewhat alien quality. No joking around on this float – all business I think, driver very serious. And why black cats? I guess we’ll never know. Still, I send a tip of the hat to Glarus – I do mean to stop by if I’m ever in the neighborhood.